Let's move away from Mark Knopfler but stay in familiar territory with this second CD. This album also very guitar orientated but has a rawer, rootsier, more Texas/Country/Blues feel to it. A good prelude to the Blues up ahead in our reviews, while staying very melodic and accessible. The pains and groans of a man hard done by life, brought to us by a deap, growly voice accompanied by a roughly strummed acoustic guitar and a heavily distorted electric guitar. 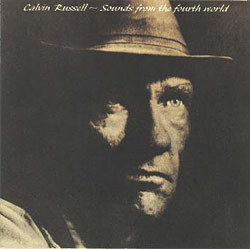 The album's cover gives a pretty good impression of what Calvin Russell looks like and indeed, sounds like: rough, dirty, bitter, hardened by life. As far as I was able to find out, Calvin is from Texas, an ex-convict, and in general, a rather ragged fellow. Now from that description, you might be expecting some typical 'bad guy' music but that's not to be found anywhere on this album at least. Calvin communicates his ideas quite subtely, using both musical and lyrical effects. However, unlike Mark's recent work, it stays very raw, with some rough, hard sounds and dark, bluesy melodies. I think the primary quality of this album is that it's honest: it's a real bloke who's been through a lot, telling us stories from his life without pretending to be something he isn't. So the music, just like the man, is rough around the edges, sometimes clumbsy but allthemore convincing for that very reason. To his advantage, Calvin has a very deep growly voice which fits perfectly with the themes of his songs. Along with his rough, clumbsy acoustic guitar strumming and his howling, screaming electric guitar licks, it gives the album a very characteristic sound, a sound giving the ideas and the lyrics a certain credibility, a credibility one of these young kid superstars with their flashy shows and fancy tricks could never have. The second track on the album is Last Night, the story of a guy who is obsessed with some woman and goes out looking for her in the bars at night to see what she's doing, who she's with. While the subject is neither very profound nor very original, the song is very nicely pieced together. The textures are good: rough and dirty as always with Calvin but they fit particularly well in this situation where an old, rough looking dog is running after some smart looking lady. The lyrics are quite vague but mention the important things like "Afraid I would find you, Afraid you couldn't be found" which is the typical thought you have when you're looking for someone. Finding her would be awkward and painful and not finding her would be just as bad because you wouldn't know where she is and start imagining the worst things. The details of the situation are not explained which allows everyone to interpret it how it suits him but the feelings are explained in detail: bitterness in the verse "The kind where you gotta dress right or they won't let you in" and pain and anger in "And you do the same damn thing to me". That last verse is one of the key moments in the song, the singing is particularly emotional and it's followed by a screaching, screaming lick on a heavily distorted electric guitar. The next song, One Meat Ball, is one of my all time favourites when it comes to the 'Blues feel'. A poor fellow finds a dollar bill somewhere and wanders around restaurants to see what he can get to eat for 1 dollar. It turns out all he can get for that price is 1 meat ball. The situation is very silly but the thoughts racing through the little man's mind as he sits alone at his table and timidly orders his 1 meat ball aren't at all. Obviously, the waiter laughs at the poor guy when he takes the order and makes a big joke of it with the rest of the staff. There are two versions of this song on the album: acoustic with saxophone and an electric one. Each has its own qualities but the musical textures in both, wonderfully express how this little man sinks down deeper and deeper into his chair and into the floor in total humiliation, as the staff and the other guests in the restaurant laugh at him. That is, for me, the perfect example of what the Blues is about. Musically, the song hasn't got much to do with the Blues but the theme, a simple, everyday situation which emotionally turns into someone's worst nightmare, is the essence of any Blues song. One Meat Ball is the kind of song that makes you feel less ridiculous when you feel down just because the girl at the cash desk didn't say hello when you went shopping in the morning. Calvin Russell's most successful song is Crossroads which is also on this album. It's a long acoustic thing which builds up to a dramatic solo at the end. The story is a guy standing at some crossroads wondering which road to take, an image for someone thinking over an important decision he has to take in life (just like that very tiresome Robert Frost poem, The Road not Taken). The voice is the star in this song. Calvin's deep, dark voice reflects the seriousness of the decisions to take in life, and the desasterous effects they can have. The voice is accompanied by a slow, reflective, acoustic riff all the way. The song ends with a magnificent acoustic guitar solo. You're extremely welcome to express your views on the albums or suggest related artists. You can do this heading on over to my Google+ Profile by clicking the link in "My Other Publications" or by using the "Discuss this article..." link in the footer of each post.